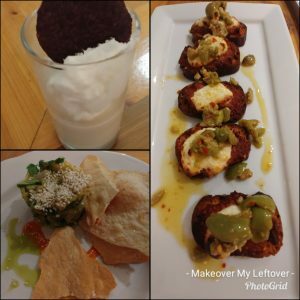 I was recently in New Orleans for the annual International Food Bloggers Conference, always an amazing three days of learning, networking, and, of course, eating. It is, after all, a food blogger conference. Long days requiring lots of coffee to keep me moving. Each year alumni bloggers are offered a ridiculously reduced rate to attend in return of three blog posts. We are fortunate to gain so much knowledge in so little time, our heads and notebooks are full (not to mention our bellies) and we are ready and eager to share our experiences upon our return. I was lucky this year that the conference was in my hometown of New Orleans. 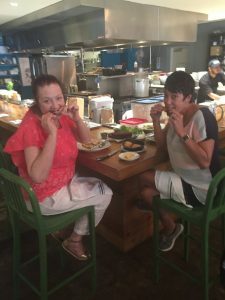 I got a chance to “show-off” my city with some of my food blogger friends. I also had the opportunity to extend my stay for a few days longer in order to squeeze in more restaurants and more eating with friends. August offered us many “Coolinary” Menus to choose. If you want to try some of the fancy restaurants in New Orleans, August is the time to do it. The “coolinary” menus offer multi-course meals for very small prices. For instance, we had a $21.00 3-course lunch at Antoine’s with 25 cent martinis! One of the restaurants my friend Liza and I wanted to enjoy was Toups South by Chef Isaac Toups. You might remember him as the “Fan Favorite” on Top Chef. Upon walking into the restaurant my eyes were torn between the absinthe fountain on the beautiful stately bar built in 1851 by the Brunswick company, yes the pool table company, and the bright 20 seat wrap-around “exhibition style” open kitchen. We made our way to the corner of the wrap around kitchen so we could have a birds-eye view of all the kitchen creations. I admit sitting that close to a commercial kitchen had me missing my restaurant days. 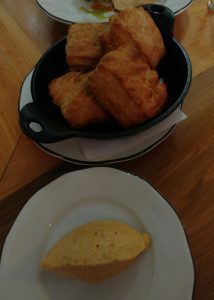 We started our meal with Sourdough Biscuits with Crab Fat Butter. Then my friend and I made the wisest decision of our lives. We ordered the Bone-in Pork Chop Stack. The menu said “Serves 2”. So we figured 2 pork chops, one for each of us, perfect. But we were shockingly wrong. A large cutting board was presented to us (I swear I think I heard church bells ringing as it was) with not 1, not 2, not 3, but 4 HUGE pork chops. The pork chops were speared with a large kitchen knife, or should I say sword, for when my friend tried to remove it, it was if she was Arthur pulling Excalibur from the stone. As if 4 beautifully prepared, moist and juicy mammoth pork chops were not enough, they were accompanied by 4 slices of white bread, pickled summer squash, and coffee aioli. Coffee aioli, sounded interesting I thought, so I first politely dipped the tip of my fork in for a taste with the thought of leaving the rest for my friend for I’m not a big aioli fan. No dice. The coffee aioli made the pork chops the best thing I ever ate and we both agreed it was so good it could be drinkable. Lucky for us, we beat the lunch rush and were able to score some more aioli. We were then able to truly cherish each bite, truly cherish, as in we picked up the chops and left nothing to waste. We talked about what ingredients could have been in the coffee aioli. I kept going back to creole mustard. Since lunch that day, my mind has kept going back to that coffee aioli. 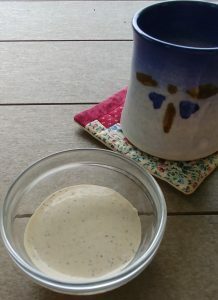 Last week as I sat looking at some leftover coffee in the pot, I started daydreaming of the incredibly delicious condiment and thought, “I wonder if I could make some that could even come close?” I’m happy to say I did. It’s not exactly the same as Toups South for how can magic be recreated, but for me it is close enough to satisfy a craving until my next trip to the City. It’s perfect on a leftover pork chop sandwich, too. Oh, in case you are wondering, as tempted as we were to eat all 4 pork chops, we did not. 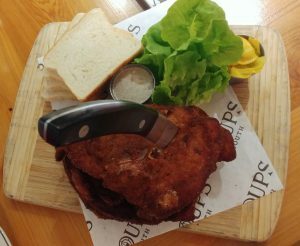 We had our food blogger friend Eli to pick up at the airport and we wanted to share the awesomeness of the pork chops and coffee aioli with him. On a side note, with to-go boxes on his lap, our friend couldn’t resist the urge to dig right in, just like we did. It was that day that I realized a new food waste strategy, dine with friends. By all means if you want to make your own mayonnaise, go ahead, it will only enhance the flavors. I didn’t have any eggs on hand, so I took the easy way out. Put in refrigerator at least 6 hours or overnight before enjoying. Put Your TO COOK IS TO CREATE Thinking Cap On: I used bourbon in this recipe for I like the depth it gives to cream sauces and mayo-based condiments. What other liquors or liqueurs could you add? I can’t wait to try a coffee liqueur. I only had leftover coffee, but imagine how much more flavor leftover espresso would add. Not a creole mustard fan? How about a little horseradish? 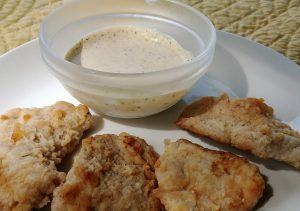 Of course, I love this aioli on pork chops and it’s great for dipping cold pork medallions, too. How else can it be enjoyed? Hubby wants it with his grilled flank steak next time and that has me thinking how it would be on fajitas. 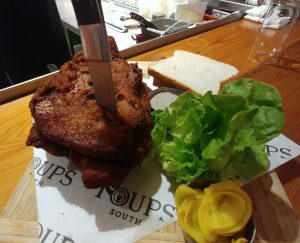 FOOD FUN: As I mentioned in my Walking To New Orleans post, Toups South is adjacent to the Southern Food & Beverage Museum. The best part about a food and beverage museum, unlike other museums, is they actually encourage you to eat and drink while touring it! 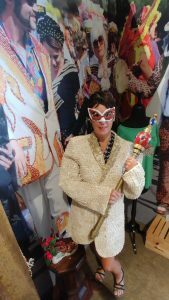 The museum houses the history of Absinthe, the story of a Louisiana Creole Queen, Mrs. Leah Chase, and memorabilia sure to take you back to your Southern food favorites. 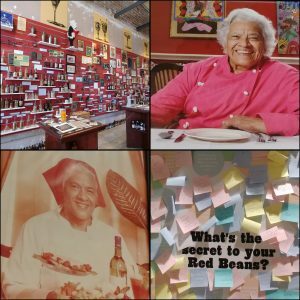 The museum also gives you the opportunity to learn some insider secrets to the best red beans and even gives you the chance to become the Red Bean Queen (or King.) I highly recommend a tour followed by lunch, at Toups South of course.